In much of this country's life, our oligarchs have schemed to erase and succeeded in discounting any skills or expertise their lower paid workers bring to their jobs. Evidently the tycoons of the NFL thought their mass entertainment industry could be run like a fast food restaurant. It couldn't. How do we force the one percent to honor the inescapable reality that the quality of life for all of depends on honoring (and paying for) the contributions of all? Drowning in presidential polls? Here's another way of looking at this endless election. 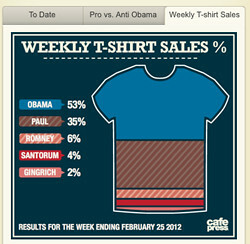 Since last January I've been capturing snap shots of this graphic from Cafe Press, showing the distribution of T-shirt orders among the candidates. 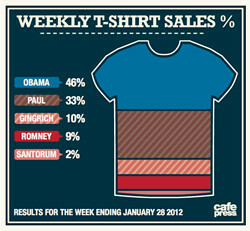 Obama looked strong in January, as did Ron Paul among the Republicans. In February, Obama had moved up a bit, while Mitt Romney had sunk deeper among the also-rans. 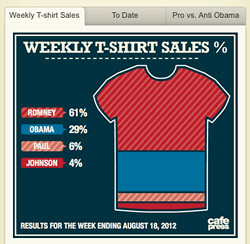 By June, Romney had won the nomination, but that wasn't doing much for him in t-shirt race. He did finally get a bump however before his nominating convention. Unhappily for the challenger, the President's Party convention rapidly erased that lead. 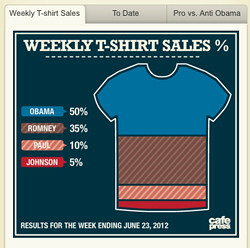 Today, Obama's t-shirt standing is close to identical to his standing in the more orthodox, and predictive, opinion polls. 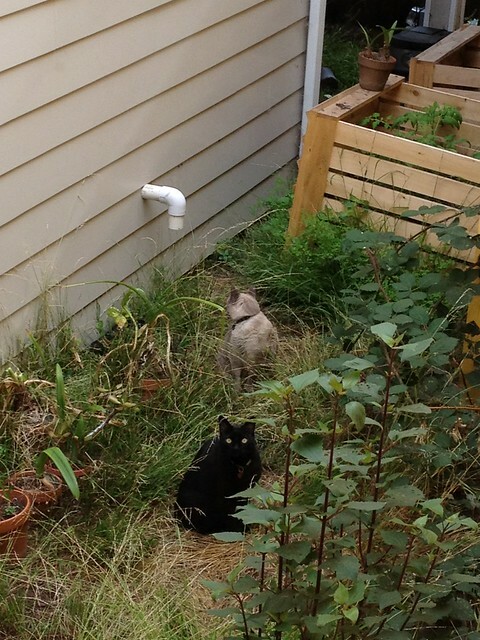 Outside a rear window, there's a mewing … someone shows himself.. 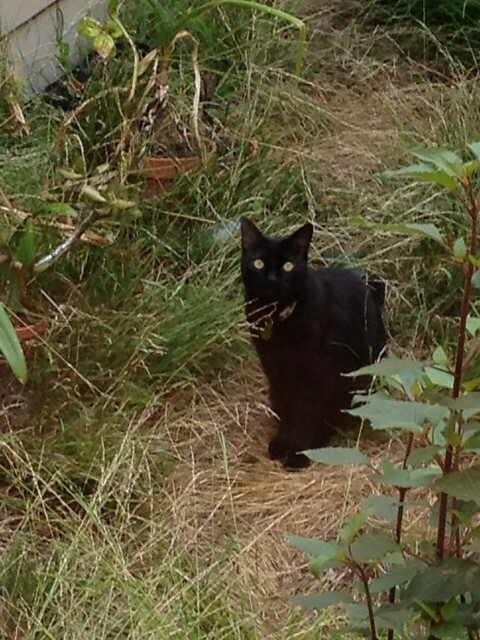 Moments later, another curious visitor. 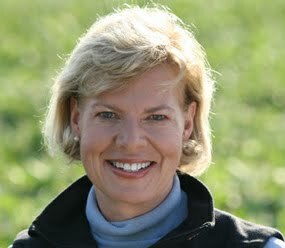 A liberal lesbian, Congresswoman Tammy Baldwin, appears to be on her way to beating former Wisconsin Governor Tommy Thompson in a race for an open U.S. Senate seat. Coming from Thompson, the suggestion to kill off programs providing health care for the old and poor seems plausible. After all, the guy has a record. It's time to remember it. In his heyday, Thompson was the innovator who pioneered "welfare reform," the vicious (and often bi-partisan) effort in the 1990s to push poor mothers of very young children into low and no wage jobs, saving the state governments and the feds the expense of keeping these families alive. In the expanding economy of the late 1990s, the "reform" didn't reveal its full horrors; some states chose, and could afford to fund, versions of its welfare-to-work mandate that did help poor families. These more generous states treated adult education as a form of work and subsidized childcare for women who took low wage jobs and lost their benefits. But then the economy blew up after 2007. Jobs were gone and so was welfare. It's no wonder that the 2010 Census showed that of all the children in America age six or younger, one in four now live in poverty. That's a unimaginable well of misery living unseen among us. Welfare reform has more than halved the welfare rolls, but it has done little to lift people out of poverty. The new law did away with existing federal guarantees of childcare and transportation subsidies for people whose benefits end when they get jobs. Many people’s medical benefits have mistakenly been terminated when they stopped receiving welfare cash benefits. In Milwaukee, Wisconsin, respondents reported working in "training" programs counting hangers at thrift stores or flipping burgers – for considerably less than minimum wage. One woman in six had experienced sexual harassment in her "work activity." There was a significant language barrier for 62% of those whose first language is not English. Judge the states’ performance by whether they end poverty, not just reduce welfare rolls. 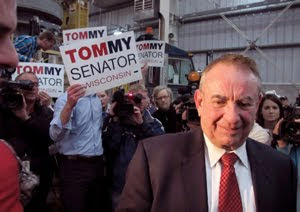 The politician most prominently associated with judging the states by whether their welfare rolls had fallen rather that by what happened to the people was Governor Tommy Thompson. You go, future Senator Baldwin! has some of the best ads around. They also have posted this highly authentic example of the best of what happens when you canvass for something you believe in: a conversation -- give and take -- follows. Enjoy these short clips and perhaps throw the campaign for marriage equality some spare change. I don't consider that an unexpected finding; after all, if we think somebody is out to get us, it is only logical to try to get a handle on what they are up to. All the more informed groups have, at some times, experienced ostracism or even persecution from the less informed folks in the United States. 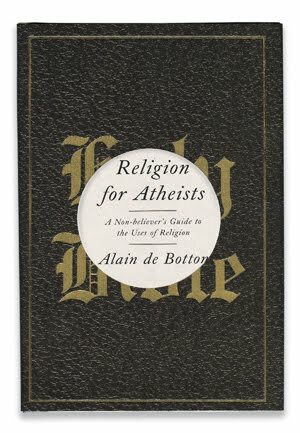 Now atheists have a book -- Religion for Atheists: A Non-believer's Guide to the Uses of Religion by Alain de Botton -- addressed to increasing their knowledge of the beneficial aspects of religious practice without trying to convert them to theism. I'm in the theist camp myself, inclined to Christian belief, but I very much enjoyed de Botton's thoughts about the milieu I share with other believers. The guy is a charming writer of the hyper-clever and articulate sort that Britain seems to produce far more often than we do. A Catholic Mass is not, to be sure, the ideal habitat for an atheist. Much of the dialogue is either offensive to reason or simply incomprehensible. It goes on for a long time and rarely overrides a temptation to fall asleep. Nevertheless, the ceremony is replete with elements which subtly strengthen congregants' bonds of affection, and which atheists would do well to study and on occasion learn to appropriate for reuse in the secular realm. Catholicism starts to create a sense of community with a setting. It marks off a piece of the earth, puts walls up around it and declares that within their parameters there will reign values utterly unlike those which hold sway in the world beyond, in the offices, gyms and living rooms of the city. … a church, with its massive timber doors and 300 stone angels carved around its porch, gives us rare permission to lean over and say hello to a stranger without any danger of being thought predatory or insane. The composition of the congregation feels significant. Those in attendance tend not to be uniformly of the same age, race, profession or educational or income level; they are a random sampling of souls united only by their shared commitment to certain values. The Mass actively breaks down the economic and status subgroups within which we normally operate, casting us into a wider sea of humanity. … the Church asks us to leave behind all attachments to earthly status. It is the inner values of love and charity rather than the outer attributes of power and money that are now venerated. … Appreciating the reasons why we try to acquire status in the first place, the Church establishes conditions under which we can willingly surrender our attachment to class and titles. It seems to know that we strive to be powerful chiefly because we are afraid of what will happen to us without high rank: we risk being stripped of dignity, being patronized, lacking friends and having to spend our days in coarse and dispiriting surroundings. It is the genius of the Mass to correct each of these fears in turn. … We may start to feel that we could work a little less feverishly, because we see that the respect and security we hope to gain through our careers is already available to us in a warm and impressive community which imposes no worldly requirements on us for its welcome. If there are so many references in the Mass to poverty, sadness, failure and loss, it is because the Church views the ill, the frail of mind, the desperate and the elderly as representing aspects of humanity and (even more meaningfully) of ourselves which we are tempted to deny, but which bring us, when we can acknowledge them, closer to our need for one another. … If we have managed to remain awake to (and for) the lessons of the Mass, it should by its dose have succeeded in shifting us at least fractionally off our accustomed egocentric axes. That is probably the rosiest, most optimistic, description of a Eucharist I've ever read. In real life, most church communities replicate the divisions of class (and race) that pervade their societies. But I like to think he has gotten to some essence of what our practice is meant to be about. He goes on to propose a nutty idea for an "Agape Restaurant," an imitation of church that he thinks would overcome some major social ills. Thanks to the Agape Restaurant, our fear of strangers would recede. The poor would eat with the rich, the black with the white, the orthodox with the secular, the bipolar with the balanced, workers with managers, scientists with artists. The claustrophobic pressure to derive all of our satisfactions from our existing relationships would ease, as would our desire to gain status by accessing so-called elite circles. Gosh, the guy sometimes reads like Paul of Tarsus: "There is neither Jew nor Greek, neither slave nor free, nor is there male and female, for you are all one …" He just leaves out the "in Christ Jesus" part. I have no idea what this book would mean to an atheist, but as a Christian I found it challenging and affirming of our better aspirations. If the atheists were to follow de Botton's suggestion that they "steal" the best of religion, we'd all be better off. But wait a minute .. aren't there still 43 days until election day? Well yes, but half the states have begun collecting absentee ballots and a few have begun in-person voting. Though I'm plenty busy with the campaign I'm working on, I quickly scan a lot of campaign journalism and punditry, looking for choice observations. As the polls have swung toward President Obama, lots of people have lots of ideas about what's going on, some insightful, many merely amusing. What follows are a few I'd like to either highlight or comment on. As we all know, Mitt Romney has been beating the bushes for more money, hoping to find enough cash to bury Obama with nasty TV ads. And when he goes out to beg, he gets an earful. Video of a high-dollar Mitt Romney fundraiser posted by Mother Jones reveals that even Romney’s most ardent supporters — the ones who attend $50,000 per plate dinners to help him get elected — are anxious that he’s just not a likable candidate. In the video, recorded at a May event, the donors can be seen confronting Romney about how he relates to the public, and begging him to improve. … Donors are not political strategists, but some pay the hefty price to get close to a candidate so they can pretend they are. Any fundraising event undoubtedly features unsolicited advice about what ad to run or what rhetoric to use. This describes one of the afflictions of fundraising in all campaigns. People who can give money expect to be able to tell the professionals how to win -- and they are probably even more likely to have wacky ideas about how to do that than the average voter on the street. By definition, the donor class lives in a different world than the average voter, but the average, disinterested voter is the person the campaign needs to connect with. The conventional wisdom has been that the Koch brothers and a bevy of self-interested conservative billionaires will ensure that Romney has a considerable financial advantage over Obama. Well, yes, all those Citizens United Super PACs are cleaning up, but a remaining fragment of campaign finance regulation still helps level the playing field. Candidates themselves are legally assured "the lowest unit charge" for their ads, while all those outside guys have to pay whatever jacked up prices a crowded market makes inevitable. Capitalism at work makes Karl Rove's millions stretch less far than the aggregated sum of the President's small donors. Read all about it from Walter Shapiro in the Columbia Journalism Review. So in the end, all the fluff and furor will come down to the opinions and whims of actual voters. As most people know, Republicans have little confidence they can sell their version of lonely individual self-sufficiency to a majority, so they've set about trying to alter the composition of the electorate in their favor by excluding people who might have other ideas. … the current voting rights issue is ... a coordinated attempt by a political party to fix the result of a presidential election by restricting the opportunities of members of the opposition party’s constituency—most notably blacks—to exercise a Constitutional right. Drew has covered politics for a generation, usually as a moderate voice of reason, so this is strong stuff. Political scientists have been studying undecided voters and learning that there aren't very many of them, really. Anyone who actually talks with voters could tell you that. In fact, when phoning for a candidate or initiative, it rapidly becomes clear in which direction most people you talk with will jump, even if they don't know yet themselves. You have to listen to them. I suspect I annoy my co-workers when I get off a call and say "she'll vote with us …" or "that one will never change." It comes of doing this for a long time. Voters who are undecided initially and those moving to uncertainty after expressing an initial preference look similar: They are less interested in politics than voters who have made up their minds; they know less about politics; they are more likely to be moderates or unaware of their political ideology; and they are less likely to have a party identification. So, when the underlying division in the electorate is quite even, our elections are decided by the least engaged segment of the population. Or, just maybe they needn't stay disengaged, at least in local contests. A report from San Antonia points out that, on a small scale, the conventional wisdom can be changed by direct invitations to vote. He made sure his candidate canvassed young Latinos and their votes elected him. More of that, all over the country, does change the electorate and hence results. What every candidate and initiative is up against in the contemporary United States is that there are no universally trusted sources of information. None. Gallup has recently documented that overall distrust of the mainstream media has hit a new high. Americans are clearly down on the news media this election year, with a record-high six in 10 expressing little or no trust in the mass media's ability to report the news fully, accurately, and fairly. …On a broad level, Americans' high level of distrust in the media poses a challenge to democracy and to creating a fully engaged citizenry. I was always taught that campaigns can spin, slice, fudge, and distort the truth, but they couldn't literally make stuff up. The political fabric of our democracy tolerates a generous amount of duplicity -- so long as there's at least a kernel of truth in the claim somewhere -- but demonstrable lies are unacceptable. Not so, apparently for Mitt Romney's media advisers. Yet barring some unexpected turnaround, all the intentional distortions of both facts and the electorate are not working for the Republicans. Mitt Romney hasn't found a way to run a plausible campaign. I'll leave the last word about that to the wise Ed Kilgore. … the Romney campaign is so locked down on tactical day-to-day maneuvering that it’s lost sight of any coherent strategy or rationale-for-candidacy, as the days quickly pass. ***Let's give yet another last word here to President Obama's campaign manager who knows what it will take to get from here to a successful election. The next night, the call was to Colorado. On Wednesday, he met privately with Senate Democrats on Capitol Hill to deliver a similar message. And on Saturday, he traveled to Wisconsin to meet with field organizers, neighborhood team leaders and other volunteers there. 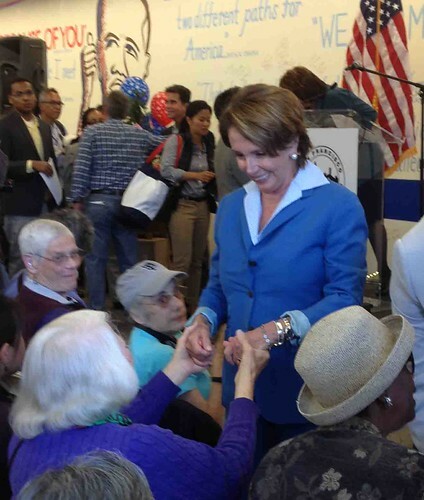 The best moment was when Speaker Nancy Pelosi pushed into the seats to greet party stalwart Jane Morrison. As Morrison pushes into her 90s, she still shows at hearings and throws fundraisers for local candidates. Our YES on Prop. 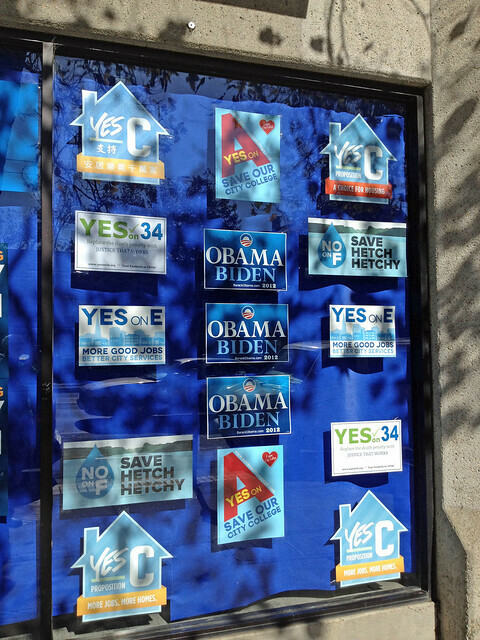 34 signs were in good company in the front windows. 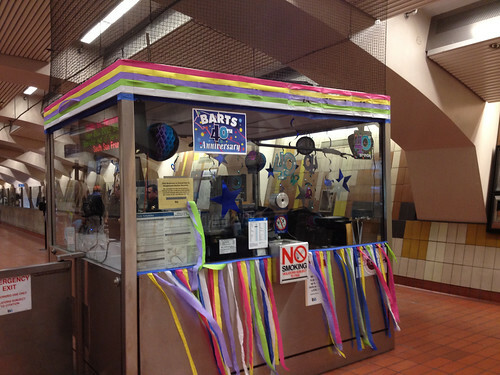 This weekend the Bay Area Rapid Transit system that I ride every day celebrates its 40th year of operation. Naturally there's a slick corporate logo for the occasion. 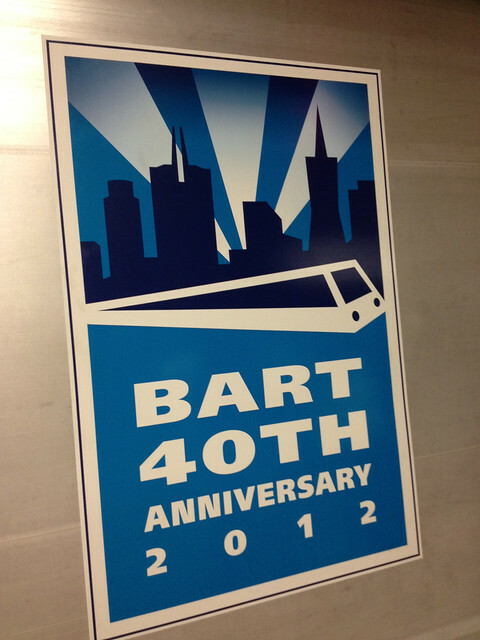 Actually BART as part of Bay Area life is a lot older than 40. It was being built during all the years I was in college ('65-'69) but not opened for several more years. Central Berkeley was all torn up because the city had decided, and taxed itself, to put the tracks underground for fear an overground route would function as a barrier between mostly African American flat lands and the mostly white and collegiate Berkeley of the university. Rising housing prices probably did more to break down that barrier (and drive out former poor Berkeley residents) than putting the tracks underground. 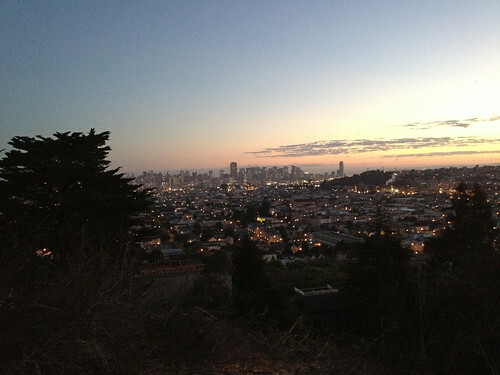 But the choice eventually made Berkeley a more pleasant city. Meanwhile we stepped over the construction on the way to the campus. The official 40th anniversary celebration includes a giveaway of stickers (she's wearing one) that might get their wearers singled out for prizes from the sponsors. But the piece of the party that caught my attention was this homegrown display at my stop, one of the more down at the heels stations in the system. Looks like our local BART employees really care about their workplace. It made me smile. 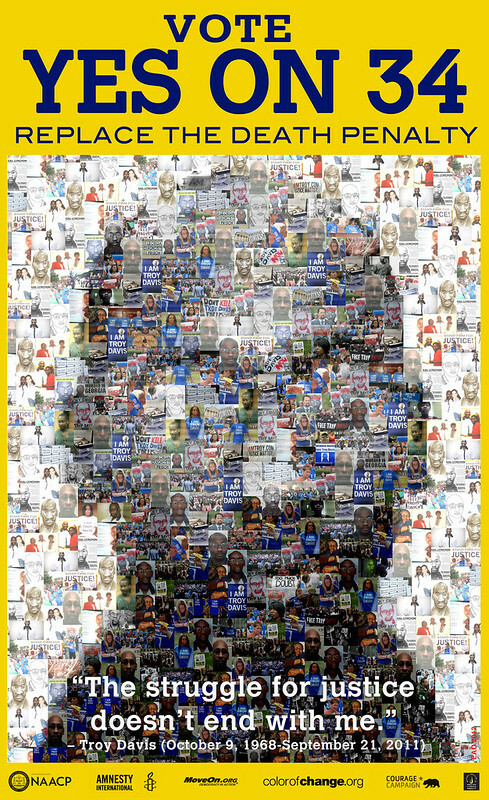 One year ago, the state of Georgia executed Troy Davis who died still proclaiming his innocence. Well, first of all I'd like to address the MacPhail family. I'd like to let you all know, despite the situation -- I know all of you are still convinced that I'm the person that killed your father, your son and your brother, but I am innocent. The incident that happened that night was not my fault. I did not have a gun that night. I did not shoot your family member. But I am so sorry for your loss. I really am -- sincerely. All I can ask is that each of you look deeper into this case, so that you really will finally see the truth. I ask my family and friends that you all continue to pray, that you all continue to forgive. Continue to fight this fight. For those about to take my life, may God have mercy on all of your souls. God bless you all. The pleas for his life of millions of people around the world who insisted there was "too much doubt" went unheard. As long as we continue to employ the death penalty, we can never know we did not execute an innocent person. If you thought I was stretching when I tied Mitt Romney's contempt for 47% of us to Republican efforts to suppress the vote -- here's a Pennsylvania Republican, State Rep Daryl Metcalfe, telling you all about it. I don’t believe any legitimate voter that actually wants to exercise that right and takes on the according responsibility that goes with that right to secure their photo ID will be disenfranchised. Pennsylvania Republicans enacted one of the most restrictive voter suppression laws in the country. You've probably seen it, but here it is. So Mitt Romney has been caught out peddling "a country-club fantasy" to dimwitted donors. (So says David Brooks who I've always thought probably felt right at home in such venues.) These folks, Romney's base, just know that the "little people" (so described by the unlamented, tax-hating hotel magnate Leona Helmsley) are parasites or worse. Certainly the moochers are not worthy of a say in the direction of their country. No wonder these donors fund a political party whose current strategy for surviving changing demographic tides is to suppress the votes of people who aren't like them. 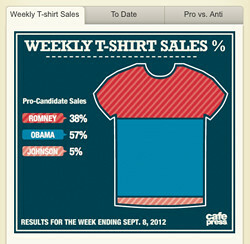 Somehow I doubt that it helps Mr. Romney's electoral chances to express contempt for 47 percent of potential voters. Apparently that bit of ancient wisdom never got through to Mitt. I think I understand him a little; as I've written previously. We're exactly the same age and I came up in an environment enough like his to catch more than a glimpse of men like Mitt. The years of our youth -- the 1950s and early '60s -- were the apogee of United States power, militarily and economically. It was easy for the more fortunate among us to believe that endless comfort and prosperity were our natural lot, to expect a rosy, an ever-more felicitous, future. Most of us eventually were jarred out of our complacency. We ran up against the brutal U.S. Vietnam adventure, the broad struggles for full democratic rights launched by people of color that spread to women and gays, the reality that our economic arrangements didn't offer a fair chance to everyone. We stopped living in a comfortable '50s bubble of capitalist self-satisfaction. But none of those things ever happened in Mitt's world. He prospered without ever encountering the United States that most of us live in. Wealth increased and he seems to have "set his heart upon it," never learning that there is so much more he can't even see. His rich donors may not spring from quite Mitt's comfort, but he's evidently an admirable figure to them, perhaps the oblivious, almost innocent, patriarch they wish wealth would enable them to pass for. Today another verse from a psalm put me in mind of Mitt. Psalm 72 asks God's blessing on the good King the deity has given Israel. He shall defend the needy among the people; he shall rescue the poor and crush the oppressor. Mitt wants to be King, but somehow he missed the part about the King's job description. ***I'm not the only religious person in whom Mitt inspires pained reflection. Joanna Brooks is a faithful Mormon who tries to explain her tradition to those of us who find the Latter Day Saints a curiosity, writing at Religion Dispatches. Mitt's Boca Moment clearly leaves her gasping. You’ve got to love the people you serve. It’s a saying I’ve heard time and again within the precincts of Mormonism. So, let’s say it again: anyone who thinks Mormonism will play some unusual or outsized behind-the-scenes influence on Romney’s campaign need only roll the Boca Raton fundraising dinner video. You’ve got to love the people you serve. At least in the abstract. And that love—Romney saves it for the donors behind closed doors. I feel Brooks' pain here. Any adherent to any faith who has to endure the public failings of politicians who claim the same faith can recognize the emotion. But you do begin to wonder whether there is something really wrong with Mitt Romney. There is something we can do about the Republicans contempt for 47% of us. These folks have an idea. What is it with Republicans and the idea of "47 percent"? This 1972 ad for another Republican, that one a sitting President, accuses Democrats of intending to create a parasitic class of welfare cheats. Also notable is the ad's depiction of a white construction worker. We've beefed up since then. In modern visuals, that guy's appearance would signal deprivation, that he was underfed. I'm not watching as much pro football as I might if this were not a hot and heavy election season. But when I do catch a snippet, I find myself asking who are these guys in the striped shirts? 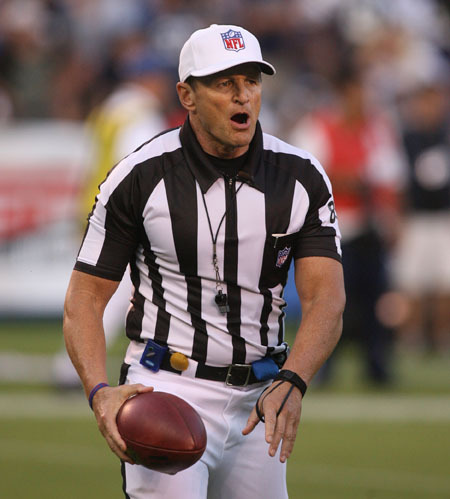 What happened to Ed Hochuli's biceps, not mention his decisive explanations of what the players just did to each other? 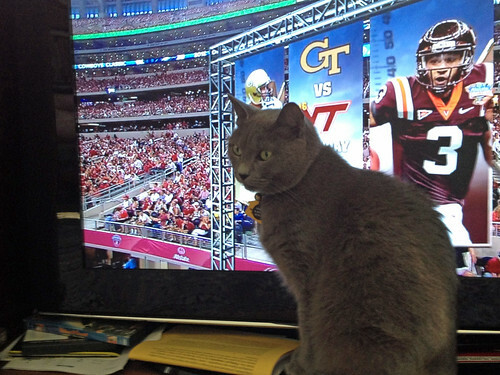 Why do the refs sometimes look bewildered? Very occasionally, commentators remark that these guys are "replacements" that is, SCABS. The owners have locked out the regular refs to force them to accept a new contract. These replacement refs come from lower level college and high school leagues. 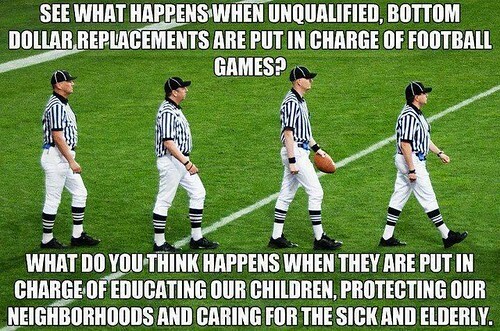 There are more experienced and accomplished officials who work high level college games such as in the PAC 12 and the SEC, but they won't step into these replacement spots because they are already in the NFL pipeline. As with the players, the big schools serve as farm teams for the pro league. And what is the labor dispute about about? Well, refs want pension benefits that would cost the league about $16.5 million a year or $500,000 per team. Sounds like a lot, until you discover that NFL revenues are around $9.3 billion a year and soaring toward $14 billion. The $500,000 annual figure per team is less than half of the median salary for one athlete, currently $770,000. Source. Unlike last year’s lockout of players, which was largely about creating the economic structure for the league for the next decade, this dispute is a relatively simple one over compensation and benefits. Current officials want to retain a traditional pension program; the league, pointing out that even many full-time league and team employees do not get traditional pensions anymore, wants to move the part-time officials into a 401(k). The league is also pushing to hire additional officials who would serve as a bench, ready to replace those the N.F.L. determines are underperforming, though some of the locked-out officials doubt the seriousness of that proposal and believe it is a negotiating tactic. It would seem to be a standoff without much of a gap, certainly not one yawning enough that a few phone calls and calm conversations could not bridge it. The lockout is about a bunch of rich owners saying "it's our football and we'll do what we want." It is telling that the sticking point is about maintaining what used to be thought a proper pension plan -- a so-called "defined contribution" plan in which the league invests money and promises it will be there for retirees when they need it. No more -- business won't take that responsibility. Instead, as in the rest of U.S. industry, the owners' aim is to toss their employees out to fend for themselves in the big Wall Street casino. It's been a full year since the understanding that it is most all of us versus the one percent took the nation by storm. However little they may like it, the presidential hopefuls and political parties are punching it out inside a country and a world that knows that. What a difference a year can make! There's an insight worth recalling. 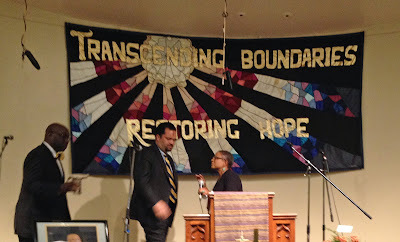 Bishop Yvette Flunder welcomes NAACP President Benjamin Todd Jealous to City of Refuge United Church of Christ, San Francisco. We must pass on our history to new generations not as nostalgia, but as instruction. From the ongoing struggle to protect voting rights, Jealous moved on to call for the passage of Propostion 34, recalling the execution of Troy Davis by the state of Georgia last September, despite serious doubts about Davis' guilt in the shooting death of a white police man. Only replacing the death sentences of life without parole will ensure that a fallible judicial system does not risk killing an innocent person. 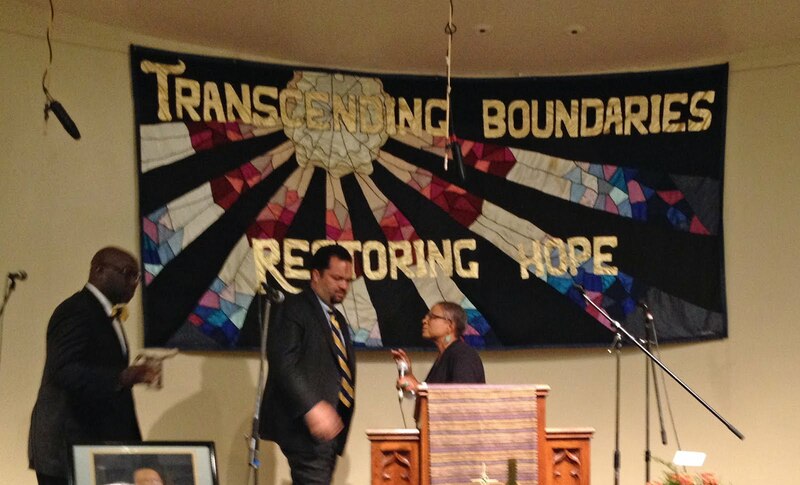 ***It was a privilege to follow Ben Jealous to a series of churches handing out information about Prop. 34 yesterday, but three religious services in a day leave me pooped. Blogging will resume when I recharge. 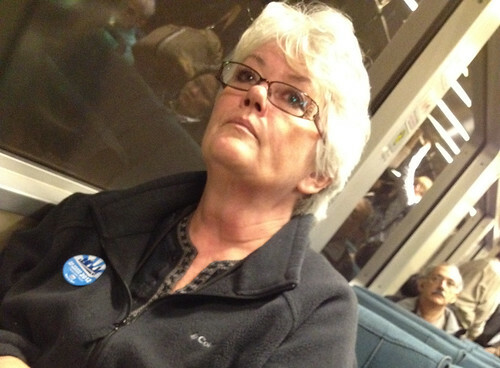 "The death penalty in California is a farce…." Voters should approve Prop. 34, for all the reasons we've laid out in editorials this week. 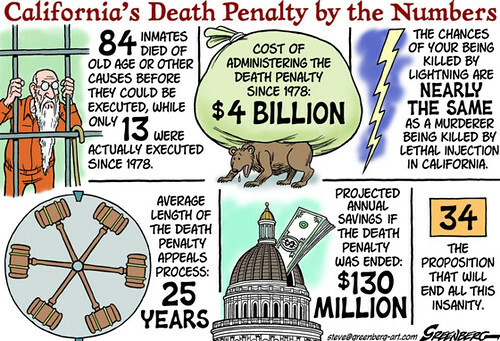 The death penalty in California is a farce. It isn't being carried out with any consistency or equal application across counties. Proponents have spent decades trying to speed up executions, including creating a Habeas Corpus Resource Center in 1998. Even so, California has executed only 13 condemned murderers since 1992, when executions resumed after the reinstatement of the death penalty. During that time, 84 inmates have died on death row, leaving 729 awaiting an execution that, for most them, is sure to never come. The whole series is worth reading; the Bee had supported capital punishment for 155 years prior to this re-examination. 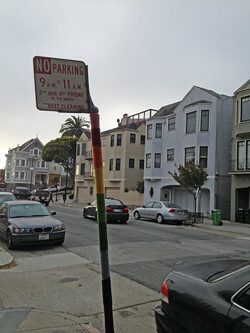 Saturday scenes and scenery: Sweaters for sign posts? 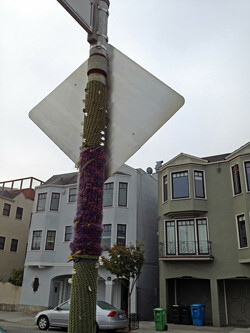 Someone on 24th Street thinks these posts need them. 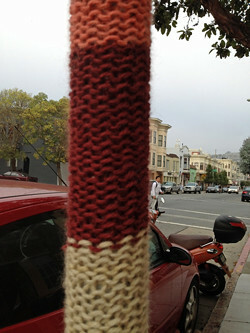 Obviously there are knitters at work. This moonscape outside Albuquerque echoed my mood -- chilly and barren -- the morning after the 2004 election. 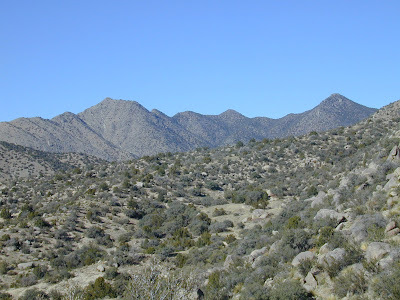 George W. Bush had carried the nation, and, of more immediate interest to me, also the electoral votes of New Mexico where I had been working. He had prevailed in the state by barely 5000 votes, a tough reminder that turning out your voters (in this case his Republican ones who were worked by white evangelicals) can make a difference. Republican Congresswoman Heather Wilson of Albuquerque was also re-elected quite easily even though Kerry narrowly carried her district. She seemed an unbeatable fixture. And she proved herself a survivor by winning again in 2006, a Democratic wave election that swept out most Republicans in slightly Blue districts like hers. But now, the former Congresswoman is running in a statewide New Mexico race for a U.S. Senate seat against Martin Heinrich, the Democrat who knocked her out of Congress in 2008. And now just about everyone seems to agree that Heinrich is a shoe-in to win, the contest not really competitive. First the national Republicans withdrew their money for TV ads, then the Dems followed suit. The emerging Latino fraction of the New Mexico electorate has turned the state Blue. As we go into the end of a campaign season in which pundits will bloviate on about how, once again, the election only comes down to a handful of the same old swing states, it is worth remembering that change does happen. New Mexico has shifted pretty definitively to the Democratic column, at least in national elections. Nevada seems to be moving the same way. In 2008, Obama made Colorado and Virginia competitive for Dems; they remain so this year. Ohio and Florida remain perennial swing states but there is real movement elsewhere. 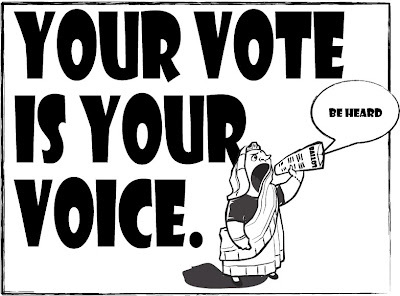 Let's turn out those voters! 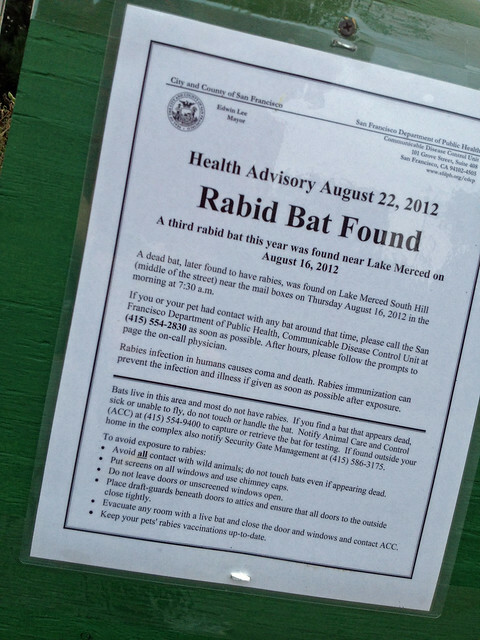 A little Googling turns up a report that rabid bats are not rare in San Francisco. But the same report suggests that there's not much to worried about. In the past three years, 12 percent of the 133 bats tested for rabies in San Francisco have come up positive. Infection among people and pets is rare. 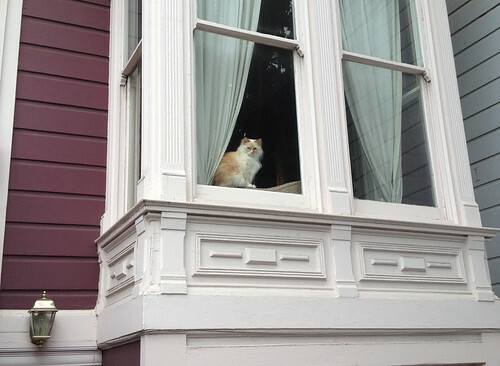 The last reported case of dog or cat rabies in San Francisco was more than 60 years ago. 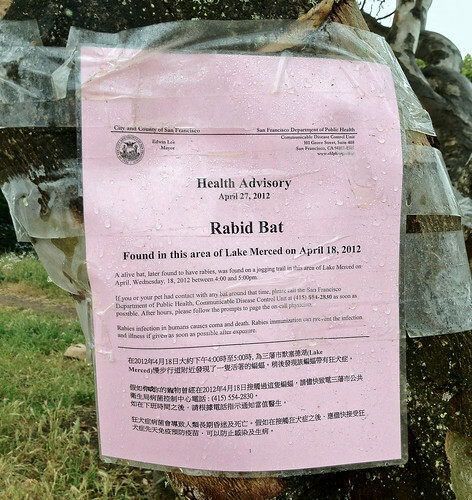 The last case of human rabies was in 1987, but the exposure happened outside the United States. One more thing to be cautious about, but not something worth being inhibited by. Now we will see what Barack Obama is made of. In an election year, can he navigate the howling of the imperial caucus, of the Israel-first caucus, and of our domestic Muslim-hating Know Nothings? A U.S. ambassador is dead in Libya, victim to passions stirred by racist xenophobes who use their freedom of speech and of religion to demean others. Meanwhile the Prime Minister of Israel pushes the United States toward an attack on Iran in response to unproven suspicions and Iranian posturing that touches no U.S. interest. Can Obama resist election year temptations to wave the bloody shirt? Will he deploy our unequalled power, as in the last decade, simply because the United States has no military challengers? The proper -- the patriotic -- job of any current U.S. leader is to manage imperial waning gracefully. The rest of the world was pretty much prostrate after World War II; the long Cold War and eventual collapse of the Soviet Union sealed U.S. pre-eminence; this concealed the enormous waste of time, treasure and talent that a permanent imperial pose did to our country. The costly inconclusive wars of the 1990s and the 2000s only show that, for the U.S., waging war is the default option. Meanwhile, letting the home country rot is acceptable to much of our elite. The Obama administration's foreign policy has not been what I would have wanted. Democratic pols have learned they must prove they are as stupidly butch, as triumphantly imperial, as the other guys. Timely withdrawal from Iraq and prospective retreat from Afghanistan had to be cloaked in bellicose gestures and ongoing chest-thumping. But the people get that more war is not in our interest. Marc Lynch at Foreign Policy has summarized some current polling on our attitudes to new wars, especially in the Middle East. I was struck by the fact that 67% now see the Iraq war as "not worth it" -- the highest result since the Chicago Council started asking that question on 2003, and crucial context for any discussion of U.S. policy options towards Syria. 68% believe (correctly) that the invasion of Iraq has not had a positive effect on the spread of democracy in the Middle East -- neocon fantasies aside, if anything Iraq's horrors provided a cautionary tale to most in the region about what could go wrong and probably helped prop up authoritarian regimes in the region by making them look better in comparison. Beyond the retrospective view of Iraq, 71% in the Chicago Council survey say (correctly, in my humble opinion) that the Iraq experience should make the U.S. "more cautious about the use of military force against rogue regimes." This is consistent with a wide range of other polling, which consistently shows very low support for U.S. military action in Syria. …The broader theme is one of humility about what the U.S. can or should attempt to accomplish through military means abroad. … And it's striking that 70% oppose a U.S. military strike against Iran over its nuclear program without UN authorization. 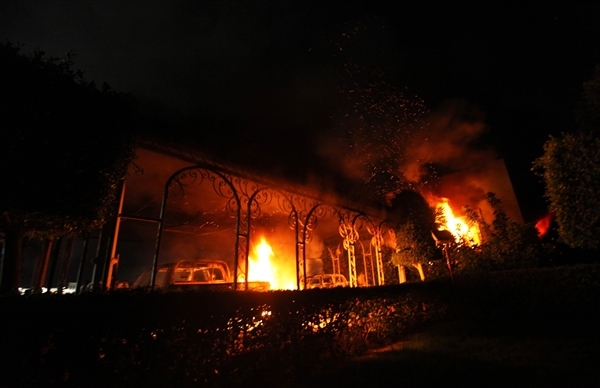 There's been plenty of chest thumping but mostly the Obama administration has concentrated on trying to repair some of the damage at home, damage left by their cowboy predecessors. We need an administration that will stay on that course. When overt military actions are avoided, the space for the struggles to restore democracy and fairness grows wider. In this election year, after the provocation in Libya, with the Israeli government and the domestic Israel Lobby yapping for war, we will see what Barack Obama is made of. If I watched television -- which I don't, except for football -- I might try to watch Chris Hayes's MSNBC show, Up with Chris Hayes. This guy is smart and thoughtful. 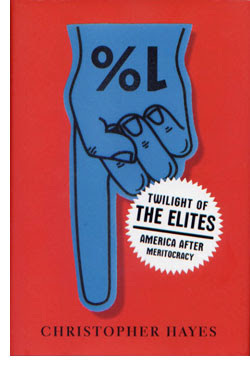 While I was reading his new book, Twilight of the Elites: America After Meritocracy, I was asked by co-workers, "Is that one worthwhile?" I said unequivocally "Yes!" Nonetheless, I've waited over a month to write anything about this interesting volume here -- letting my reactions settle. I still think this book makes insightful observations about the country we live in and I'm grateful for them -- but I found Chris Hayes' prescriptions for dealing with the society he describes pathetically inadequate to the magnitude of the problems he lays out. The problem defined by Hayes is that our society needs to believe that someone running the show knows what they are doing, is running it for the common good, and so deserves, if not to be followed, at least to be respected. But the elites running the country have largely ascended to their positions of prominence without demonstrating real merit; those elites did demonstrate pretty conclusively in the first decade of the the 21st century that they don't know what they are doing; and that their distance from the lives and experiences of the 99 percent is only getting more vast. A meritocracy must comply with two principles. The first is the Principle of Difference, which holds that there is vast differentiation among people in their ability, and that we should embrace this natural hierarchy and set ourselves the task of matching the hardest working and most talented to the most difficult, important, and remunerative tasks. The second is the Principle of Mobility. Over time, there must be some continuous competitive selection process that ensures that performance is rewarded and failure punished. That is, the delegation of duties cannot be simply made once and then fixed in place over a career or between generations. People must be able to rise and fall along with their accomplishments and failures. … the Iron Law of Meritocracy states that eventually the inequality produced by a meritocratic system will grow large enough to subvert the mechanisms of mobility. Unequal outcomes make equal opportunity impossible. The Principle of Difference will come to overwhelm the Principle of Mobility. 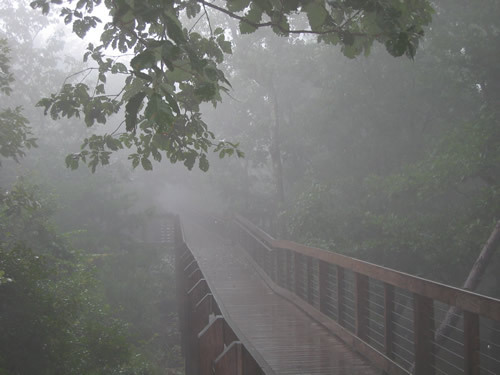 Those who are able to climb up the ladder will find ways to pull it up after them, or to selectively lower it down to allow their friends, allies, and kin to scramble up. In other words: "Whoever says meritocracy says oligarchy." The cascade of elite failure has discredited not only elites and our central institutions, but the very mental habits we use to form our beliefs about the world. At the same time, the Internet has produced an unprecedented amount of information to sort through and radically expanded the arduous task of figuring out just whom to trust. …At exactly the moment we most need solid ground beneath our feet, we find ourselves adrift, transported into a sinister, bewildering dreamscape, in which the simple act of orienting ourselves is impossible. Because revelations of systemic deception erode our most basic, default expectation of good faith, they play an outsize role in producing a crisis of authority. ….This was the defining experience of many Americans during the mid-1970s, the last period in which the nation suffered through a crisis of authority. … While the systemic deception around weapons of mass destruction [in 2003] comes closest to reproducing that same sensation in our own time, the Iraq debacle happened three decades after Watergate and Vietnam had already done a lot to rid people of their previous innocence about the American president and his war making powers. But the scandal in the Catholic Church is another story. To the devout, the lapsed, and even the non-Catholic observer, the depths of ruthlessness and depravity among church officials, as they covered up the crimes of the child predators in their ranks, induced a sickening vertigo that exceeded even Watergate's. Living through this, we're ripe for more confusion and further deception. We resort to unrealistic nostrums to reduce the anxiety of living in a society we feel is reeling, out of kilter. In an interview with Grist that builds off the book, Hayes applied his understanding of elite delusion to the current Republican presidential candidate. The ethos of competition produces elites who feel persecuted — they are always looking up the ladder and never down, and all construct for themselves a story of their own overcoming, even when it’s manifestly ridiculous. Like Mitt Romney, who got up at a Republican presidential primary debate and said, “You know, I could have inherited the car company. But I struck out on my own — I went to Harvard Law, went to Harvard Business School.” This is genuinely felt — it’s not artifice. You have to like this kind of plain speaking -- and Hayes doesn't entirely exempt Barack Obama from his observation that elites are just drifting off in their own world from the rest of us. Follow Hayes' train of thought far enough, and the logical end result of contempoarary systemic dysfunction is fascism. But Hayes doesn't go there. He sees hope in the emergence of social democratic governments such as that of Brazil in Latin American nations once far further sunk in oligarchy than ours. The good news is that in our own time, we have seen an explosion of institutional innovations. The common thread that runs through the most promising institutional innovations of this decade is, of course, the Internet. Nearly every single one of the most transformational new approaches to coordinating human interaction over the last ten years could not have happened without the Internet: the political organizing and fund-raising of MoveOn, blogs, and Obama for America, just to name a few. …The Internet plays a huge role in allowing people to self organize in non-hierarchical ways, but it's not a necessary precondition. 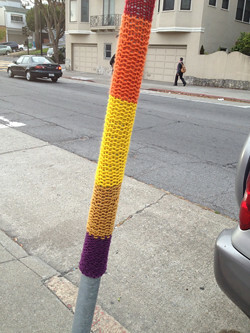 Even without the Internet, people can find new ways to come together. It is striking that both the Tea Party and Occupy Wall Street describe themselves, insistently, as leaderless. 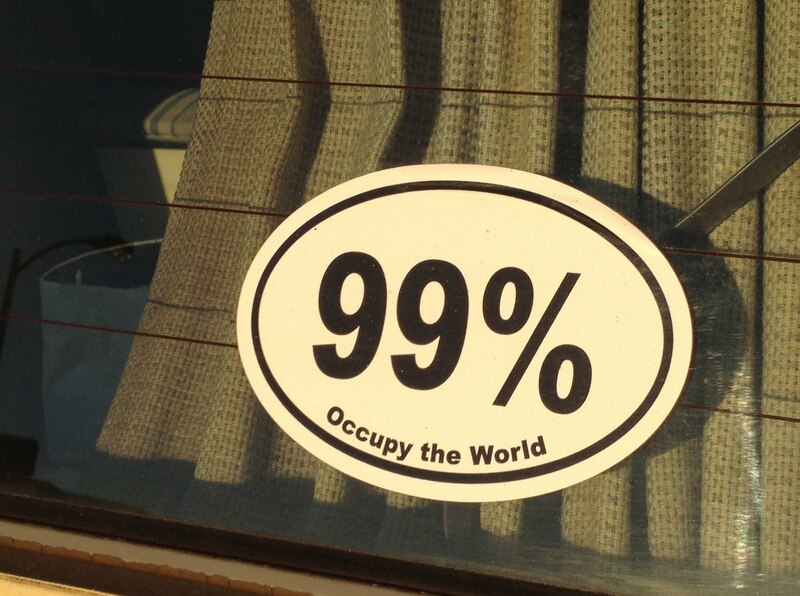 … If we are going to find our way out of the present crisis, we will need more of this kind of political imagination. We will need to imagine a different social order, to conceive of what more egalitarian institutions would. Our post meritocratic inequality is the defining feature of the social contract to which we are all a party. And the terms of that contract must be renegotiated on a society-wide level. I love the Internet as much as anyone, but this vision is not how progressive change comes. And anti-hierarchical movements that refuse to develop coherent structures seem to me to lead to exhaustion more often than popular empowerment. Major changes are made by people who have nothing left to lose and struggle for change anyway, often at great personal cost. These are people like those whose land and water are being trashed by fracking, like people who are losing their homes to rapacious banks, excluded workers like taxi drivers and hotel chambermaids who have nowhere to go but up, and the undocumented newcomers who clean our toilets and harvest our food. These folks carry most of the pain now and they will carry more in order to live better lives. Yes, people enjoying social privilege have to help, but ultimately it will be the determination of those who have no choice that can restore more equality. The struggle for equality generates its own novel expressions of political imagination -- that creativity is one of the by-products of the struggle, not its source. All that said, Hayes skewers our present elite social system and for that, the book is a fine artifact of our unhappy time. Original: We shouldn't elect Joe as committee chair because he is too bossy. Claim: We shouldn't elect Joe as committee chair. Stated reason: He is too bossy. Unstated assumption: (this is what the student should supply) Bossy people make bad committee chairs. Statement: We shouldn't elect Mitt Romney as president because he is a robot. Claim: We shouldn't elect Mitt Romney as president. Stated reason: Because he is a robot. Unstated assumption: Robots do not make good presidents. There's one that is paying attention -- and thinking. ***Blog fodder is light-weight this week because my best energies are going into recruiting help to call voters on behalf of Prop. 34. Want deeper posts? Click the link, go to the "volunteer" tab, and sign up to help replace the death penalty in California with justice that works for everyone. If you weren't filthy rich you'd be in in jail … You get one vote, that's all she wrote… this house is not for sale! Seems about right as a description of the present national election. One of the signs I use that a campaign is going strong is that artistic people start turning up with slightly off message creative works inspired by the contest. When they show up, you are making a dent. Seems as if someone is getting across that this election -- on one level -- is a fight between rule by a disdainful oligarchy and the rest of us. I'll take it. Too tired for more thoughtful blogging today, but I'll be back ASAP. 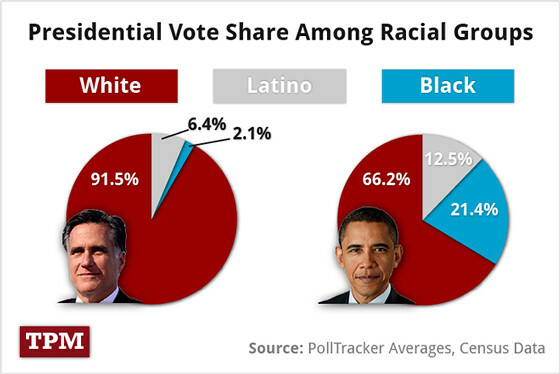 This chart from Talking Points Memo shows the racial make up of the segments of the electorate that Mitt Romney and President Obama are currently attracting. That is, current polls indicate that Romney supporters are 91 percent white, while President Obama's are more diverse, though whites are still fully 66 percent of his adherents. What I find most significant about this picture is that, if the face on the right (the President's) were not Black, most likely those percentages wouldn't change very much. A white Democrat, male or female, would find support from a coalition whose racial make up and diversity had a similar shape. At this point in history, it is impossible to imagine a Republican standard bearer who was not white -- or any Republican attracting a significant share of the Black or Latino vote. This simply is what each party's base looks like -- and what those bases would almost certainly look like if there had never been a Barack Obama. One party has chosen to hang on for dear life to an image of who is a citizen that derives from the demographic and social past; the other, however imperfectly, strives to lay the groundwork for our inevitably diverse racial and social future. TPM's explanation of its chart quotes from National Journal reporter Ronald Brownstein about how the racial divide between the parties plays out in the election this year. Team Romney has set a target of 61 percent of the white vote, according to reporting by Ron Brownstein. It won’t be easy. “If he reaches 61 percent among whites, he would equal the best performance ever for a Republican presidential challenger with that group of voters: Dwight Eisenhower in 1952, Ronald Reagan in 1980, and George H.W. Bush in 1988 each won between 56 percent and 61 percent of white voters, according to polls at the time,” Brownstein reports. … As for Romney’s effort to capture the presidency with so little support from minorities, he is fighting the inexorable demographic changes that are diversifying the electorate as a whole. “This is the last time anyone will try to do this,” one Romney adviser told Brownstein. This election, and its aftermath, will be about how anxious white voters -- "Romney whites" who will make up nearly 50 percent of the total electorate -- come to terms with the change in the racial make up of their country. The last few years have been ugly. The ugliness has been much exacerbated by the President's Black skin. But the two party's divergent views of our future are not only a response to one individual Democratic leader who is African American. When the President is re-elected in November as seems likely, perhaps more of us can come to terms with the inevitable. We are a racially diverse society. Choice doesn't come into it. 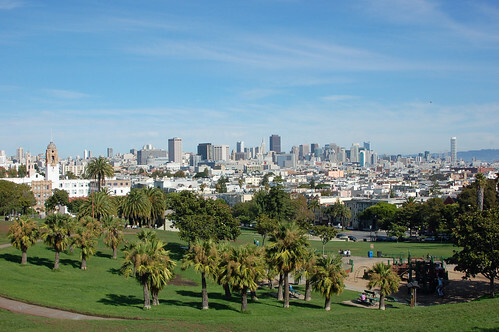 The contours of the city create an image almost begging to be captured; this one from within over Dolores Park is a classic, often used by aspiring politicians as setting to signal their allegiance to our home town. 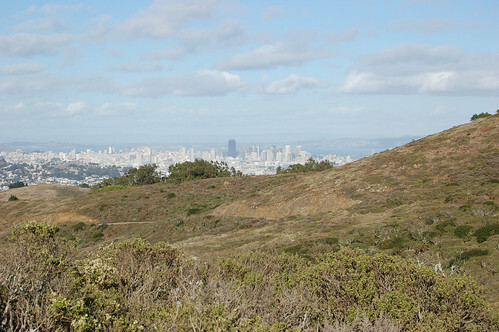 From several miles south on San Bruno Mountain, the city seems less distinct, but more intriguing. At dawn there's a hint of promise -- what will the new day bring? 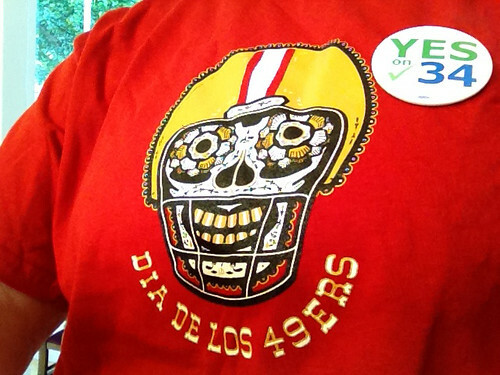 Tis the season of politics -- and also the season of football! Yeah! (Yes, there are similarities.) Morty is determined not to be overshadowed. I'm not watching the Democratic convention; I'm working. So I'm glad I ran across this speech by a young woman -- a DREAMER -- who the party put briefly on the podium. Until recently, Benita Veliz could have been deported for sticking her head up. She was brought to this country without papers as a child; she aced high school and college and is the kind of young person who makes our society better. But current immigration law provides NO WAY for her to legalize her presence in her country. President Obama has offered at least a temporary executive order remedy for some of the million or so young people in this situation. But Republicans in Congress won't even consider a real overall of failed immigration policies. There is a solution, though not a quick or kind one. Latino voting numbers are growing all over the country. The children of immigrants are citizens. More and more, they vote. Republicans have trapped themselves in pipe dreams that these unfamiliar newcomers can be forced by abuse to "self-deport" in Mitt Romney's ugly phrase. Dems may not always have been much more welcoming, but they have figured out that Democratic success requires that those new Latino voters become part of their sprawling coalition. That's democracy at work. Better policies become mighty attractive when they have numbers of empowered people behind them. Don't get me wrong -- I'll be voting for President Obama and I sure don't want the other guy. That one seems to be an ambitious sociopath, adhering to no principle but his own benefit. It would be irresponsible not to strive to get the lesser evil. Okay, so they didn't grow the (Cuban) gulag, but they completely failed to reverse the ongoing disdain for domestic and international law and norms by our hyper militarized imperium. If not in words, the Obama administration in practice has followed the Bush/Cheney trajectory of admitting no limits on its conduct in the name of "security." Now it emerges that they intend to keep a nice, unregulated offshore prison in Afghanistan once the U.S. finally withdraws. (I won't be surprised if Afghans manage to undermine that plan.) And there is no sign that the voters care about all this imperial overreach, so naturally the politicians don't either. I don't write about national security and civil liberties issues as much as I should. Partly this is because I find much of it too grim to bear. But it's also because it seems so hopeless: there's really no significant difference between the two major parties on most of these issues, and therefore no real chance of any of them being changed. There are differences at the margin — Obama banned torture and Eric Holder at least tried to institute civilian trials for terrorist suspects — and during campaign season even modest differences become magnified. But really, there's a pretty broad bipartisan consensus on all the big stuff: drones and assassinations and secrecy and military intervention and the ever increasing role of surveillance in our society, just to name a few items. Minimally, those of us who do care must keep on telling the truth about these matters; otherwise we betray ourselves. Do we still need political conventions? I very much doubt it. I shared my point of view last week: the national party conventions are a a vestigial artifact of a bygone era. But there clearly are people who disagree and I got a taste of their feelings last night. This was our first night phoning voters to ask for support for Prop. 34, the initiative to replace the death penalty with life in prison without parole. With Prop. 34, we'll have no further risk of executing an innocent person in this state and huge savings of taxpayer dollars too! 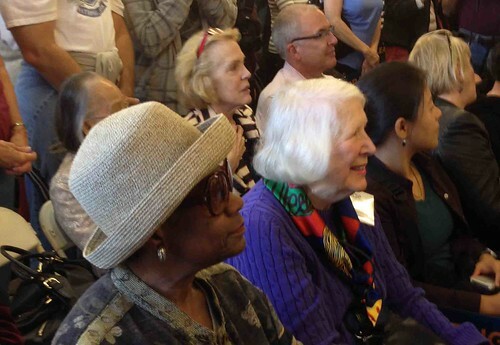 We chose to talk with older, Democratic women. This could hardly have been a more affirming experience. Though most voters are just beginning to consider California's long list of propositions (eleven this year! ), we found a lot of support. But also, these women let us know we were breaking in on their viewing the Democratic Convention. They were enthusiastic, excited by the show in North Carolina. 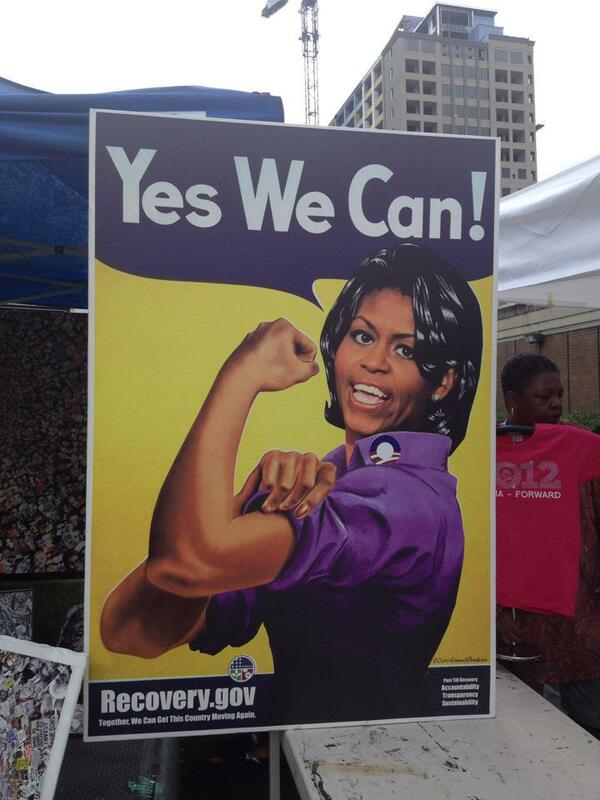 Guess they love them some Michelle Obama! Photo from Charlotte, plucked off Twitter. Some of the most interesting material in David Walker Howe's What Hath God Wrought concerns religious developments in the new U.S. republic. The period the volume covers -- 1815-1848 -- saw the outburst of millennial religious fervor known as the Second Great Awakening. This evangelical movement probably did more than conscious political agitation to make the new democracy ever more inclusive for more of its residents. American religion flourished in a society with a thinly developed institutional structure, enlisting the energies of the people themselves. The most important social consequences of the Awakening in America derived from its trust in the capacities of ordinary people. In the early American republic, the most significant challenge to the traditional assumption that the worth of human beings depended on their race, class, and gender came from the scriptural teachings that all are equal in the sight of God and all are one in Christ. This was not an era of big government -- in fact, on the expanding frontiers, it was scarcely an era of government at all. The various evangelical sects cooperated to provide a thin tissue of social structure in shapeless circumstances. The list of evangelical benevolent associations is long and bewilderingly varied. …Contemporaries called the interlocking, interdenominational directorates of these organizations "the Evangelical United Front" or "the Benevolent Empire." It is scarcely an exaggeration to say that the United Front aspired to transcend America's sectarian diversity and create the functional equivalent of an established church. Its advocates declared that bringing souls to Christ and ushering in His Kingdom took precedence over the theological differences dividing the various Protestant sects. They therefore embraced interdenominational ("ecumenical") cooperation in the service of a general "reformation of manners" both personal and institutional. Of course, their conception of cooperation did not include "unevangelical" denominations, like Catholics and Unitarians. The United Front had religious competitors and the history of its tensions with other sects had a lot to do with how "separation of church and state" developed in this country. Roman Catholicism gained adherents broadly during this period and also sometimes found its international hierarchical structure in tension with U.S. democracy. The growth of Catholic numbers depended very much on proselytizing in these years, something I had not understood before reading Howe's account. The Roman faith was not brought whole cloth by immigrants from Catholic countries. The U.S. Catholic church experimented with structural innovations suited well to the new country, though revolutionary in the eyes of Rome and of some U.S. Catholics. [John Carroll was] Bishop of Baltimore and the first Roman Catholic bishop in the United States … A native-born American and cousin to Charles Carroll, signer of the Declaration of Independence, he had been elected bishop by his clerical colleagues in 1789, the same year his friend George Washington was elected the first president. Rome (preoccupied with more momentous events closer to home) went along with the strange procedure. Bishop Carroll undertook to demonstrate to a skeptical public that his church could reconcile itself to republicanism.... Staunchly patriotic and Federalist, Bishop Carroll made it clear that American Catholics embraced freedom of religion, which he grounded in natural law. … In 1820, the pope appointed as Bishop of Charleston an Irishman named (ironically) John England. Bishop England earned the effort to Americanize the Catholic Church still further, creating a written constitution for his diocese that included participation by elected delegates, clerical and lay, in an annual convention. This experiment in representative government did not outlive the bishop who created it. But reciprocating such overtures, the houses of Congress invited Bishop England to address them in 1826 and in 1832 chose a Roman Catholic priest as their chaplain. The great issue of the day, the issue around which religious and moral authorities sorted themselves, was whether slavery should continue to be allowed and spread across the land. Protestant denominations split geographically -- north and south -- over this moral issue. Roman Catholicism was not a progressive force on this divisive issue. The Roman Catholic Church in the United States adopted a position not far removed from that of southern evangelical Protestants -- if anything, more conservative. In 1839 the otherwise arch-conservative Pope Gregory XVI forbade Catholics to participate in the Atlantic slave trade (by then largely in the hands of the Spanish and Portuguese) but did not condemn slavery itself. Scripture and natural law (going back to Aristotle) sanctioned the institution so long as masters permitted slaves to marry and receive religious instruction. Even when masters did not live up to their obligations,the church taught it preferable to suffer the wrong than to risk social turmoil, perhaps even race war, by immediate emancipation. 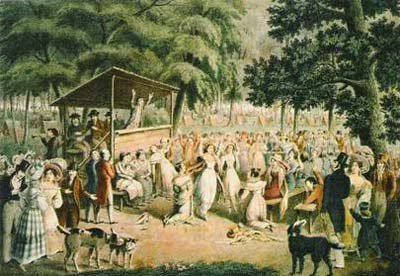 Abolitionist rhetoric invoked principles derived from Protestantism and the Enlightenment, and emphasized the urgency of the slavery problem; it conveyed little appeal to antebellum American Catholics. Their religion honored the spiritual discipline of patient suffering and submission more than Protestantism did, and valued individual autonomy less. Sometimes individuals had to sacrifice for the sake of public order or community welfare, even to the point of accepting enslavement. In Europe, the Roman Catholic Church generally set its face against liberalism, modernism, and republicanism. It had not embraced the Enlightenment as Anglophone Protestantism had. The strength of religious allegiance in the United States remains a wonder to much of the developed world to this day. Howe's complex and nuanced survey of religious currents before the Civil War elucidates much about where that element of our exceptionalism came from. And the tensions over the intersections of churches and state that he describes seem very contemporary indeed. Other posts about What Hath God Wrought: Speed, communications and hope, Elections: Rousing the sluggish, Doubling down on whiteness, and Mitt and the historic Mormon paradox.